Hi, I’m celebrating – today is the first day I’ve not woken up with a migraine for too long. When I get a fairly good day I smile and give thanks – harder to do on the other days, more like clinging on by my fingertips. AND I made the easiest tart ever! 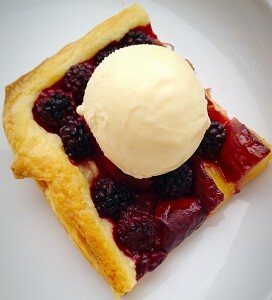 This Blackberry Nectarine Tart is made with shop bought, all butter, puff pastry, a tub of blackberries (mine were frozen) and a punnet of nectarines – you could easily use peaches instead. 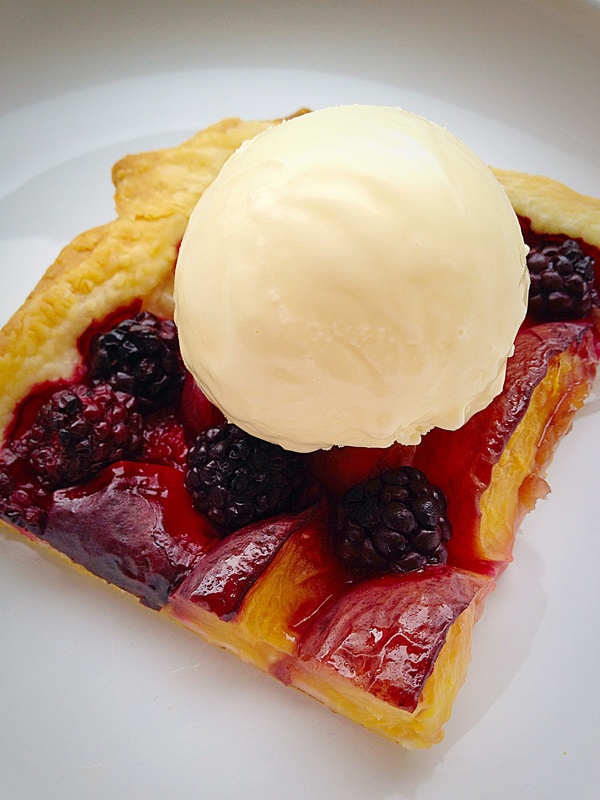 Blackberry Nectarine Tart – perfect with a scoop of vanilla ice cream. If you think roasting vegetables intensifies their flavour, then imagine what 30 minutes in a hot oven does to the fruit in this tart? Even with the addition of a sprinkle of vanilla sugar the intense fruit flavours in this Blackberry Nectarine Tart are a delight on the taste buds. Yet this is not a sweet tart. For me it’s a perfect balance of fruity flavour and flaky, buttery pastry. 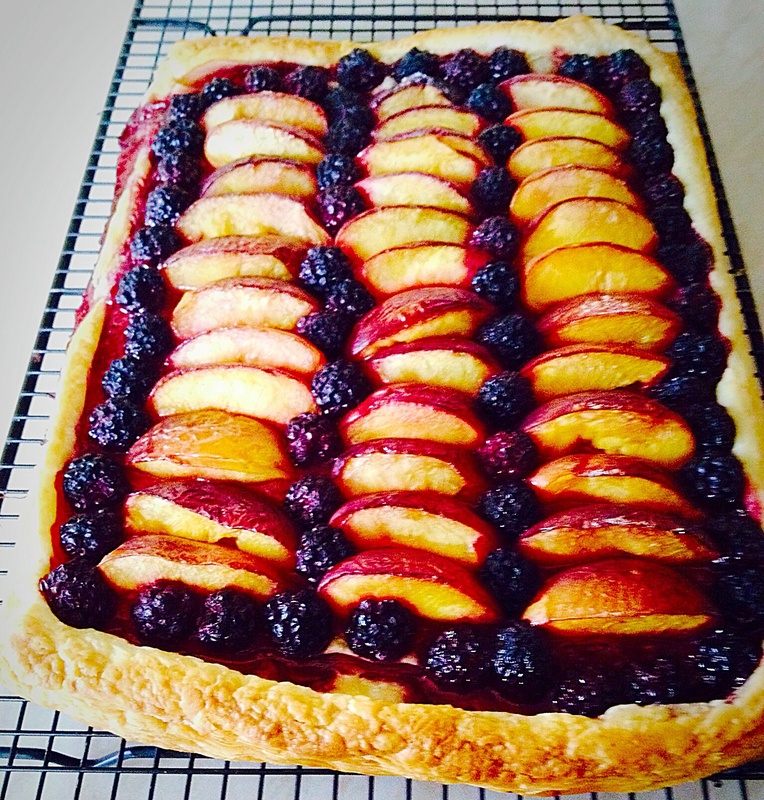 Blackberry Nectarine Tart – beautiful and delicious. I really can’t emphasise how easy this tart is to make. 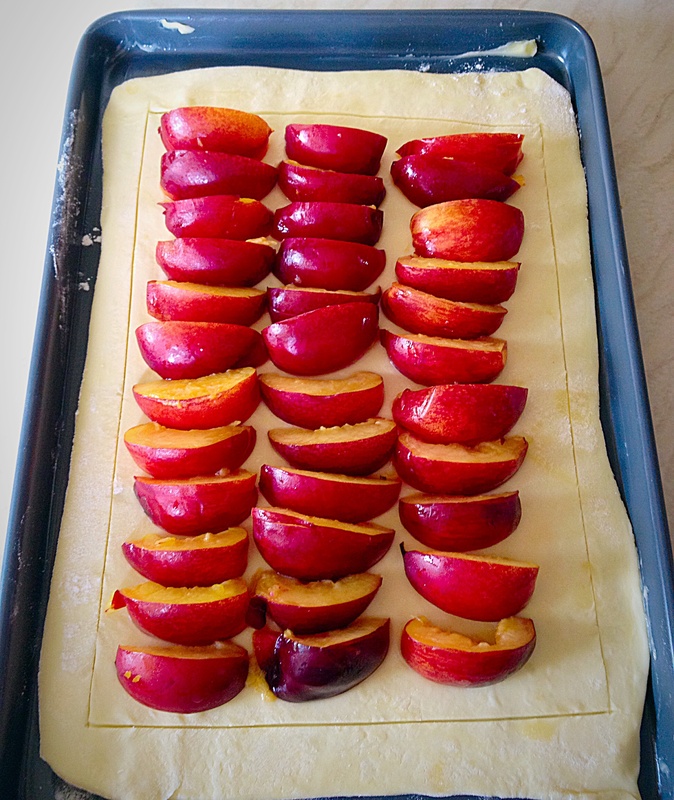 Since the pastry and blackberries were in the freezer, the nectarines, ridiculously cheap and in season, ripening at an increasingly rapid pace, needed using. Given how well this tart turned out I would happily make this during the colder months using, shock, horror – tinned peaches! Yup I would, with custard poured over. I am shameless!!! 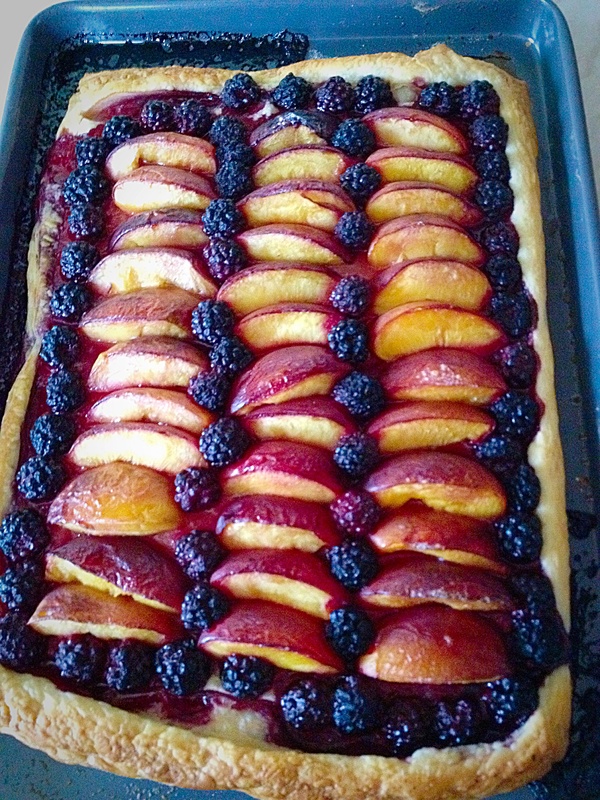 Blackberry Nectarine Tart – a perfect summer dessert, even in the winter. Grease or line with parchment paper a baking tray with shallow sides, the fruit give off juices when baked, 26cm x 39cm (10.5″ x 15.5″). On a clean, dry, lightly floured surface, roll out the pastry so that it will just fit in the baking tray – I haven’t given dimensions, as if your baking tray size differs from mine a few centimetres either way, it won’t matter. 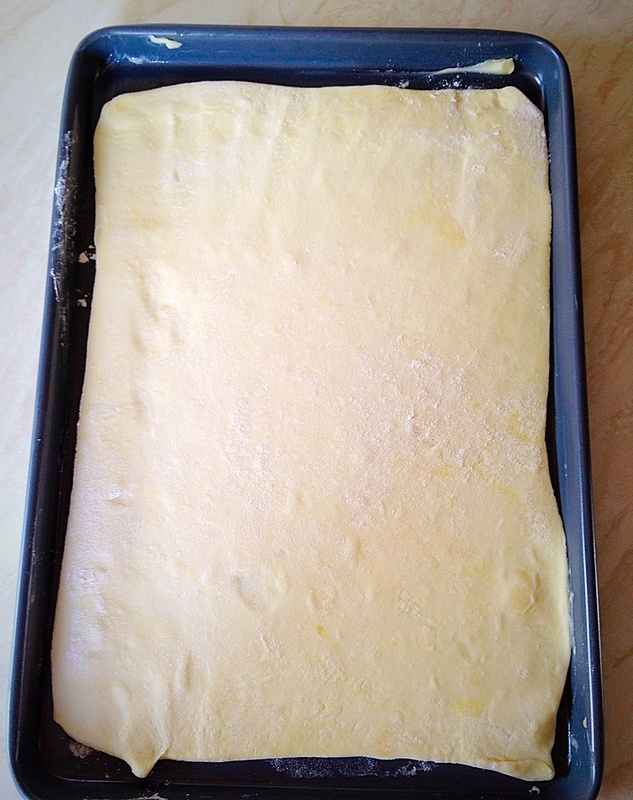 Using your rolling pin transfer the pastry to the baking tray. I lightly scored the pastry approx. 1cm in from the edge with a sharp knife. 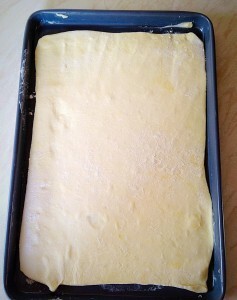 This would ensure that a nice, even, crust, bordered the tart. Next slice each nectarine into 6 equal(ish) portions. If they are still firm this should be fairly easy. Mine were very ripe so I cut out the slices, against the stone, whilst holding the nectarine, over a bowl to catch the juices. 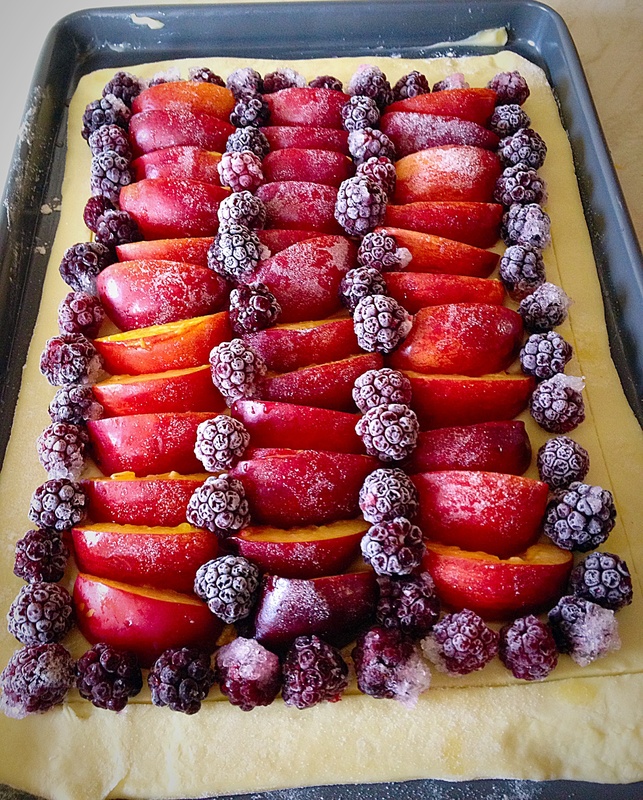 Blackberry Nectarine Tart – arrange the nectarine slices in rows. 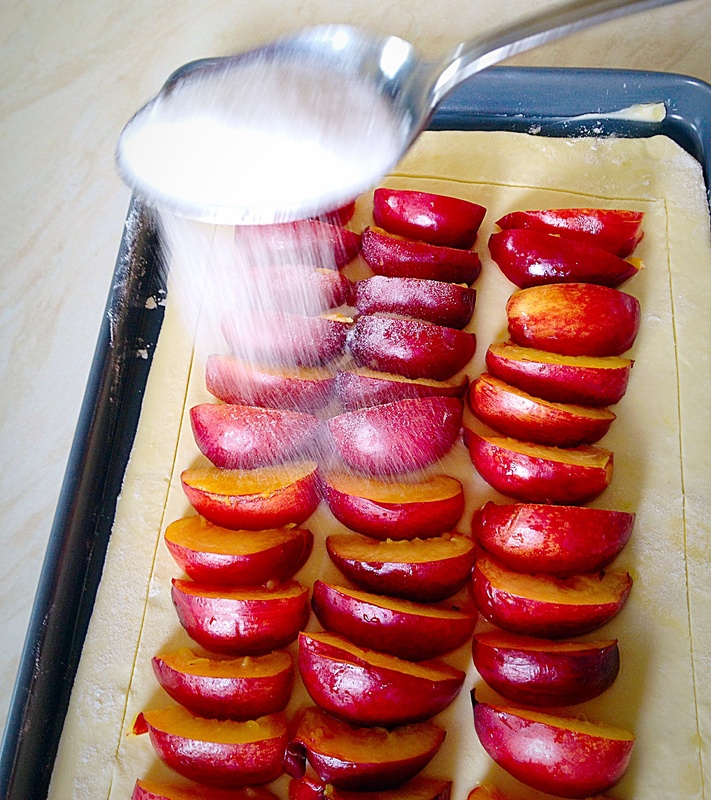 Blackberry Nectarine Tart – sprinkle over 1 tablespoon of vanilla sugar. You can buy Vanilla Sugar, or alternatively you can make your own. 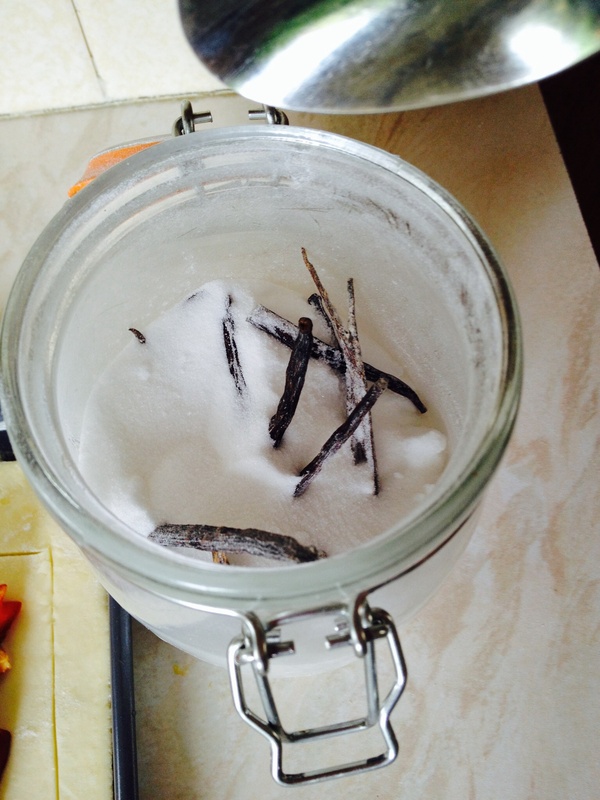 Vanilla Sugar – I have a Kilner jar filled with caster sugar and a few vanilla pods. Leave for one month and the vanilla will have infused the sugar with it’s delicious flavour and scent. Tip : A light (little goes a long way) sprinkling of Vanilla Sugar over homemade popcorn is delish!! Next arrange the blackberries on the tart, however you choose. I chose to go with the lines of the tart. Blackberry Nectarine Tart – using frozen blackberries I think helped them retain their shape during baking. Place the tart in the oven and bake for 30 – 35 minutes. 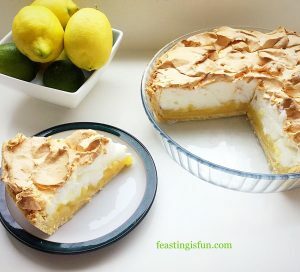 There will be some juice that leaks, but I found, once the 30 minutes baking time was up, it had concentrated and did not make that part of the tart soggy. The tart is cooked when the outside crust is golden brown and the base, when gently lifted, is golden brown too. 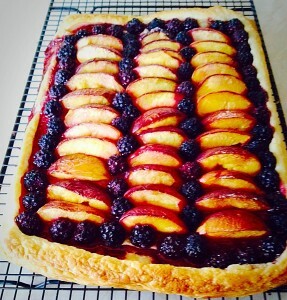 Blackberry Nectarine Tart – once baked remove from the oven. Immediately remove the Blackberry Nectarine Tart from the baking tray and place on a cooling rack. This keeps the tart bottom and crust nice and flaky. Blackberry Nectarine Tart – if you like a bit more sweetness a dusting of icing sugar would be perfect. Serve warm or cold. This tart was perfectly complimented by a scoop a good, vanilla ice cream. 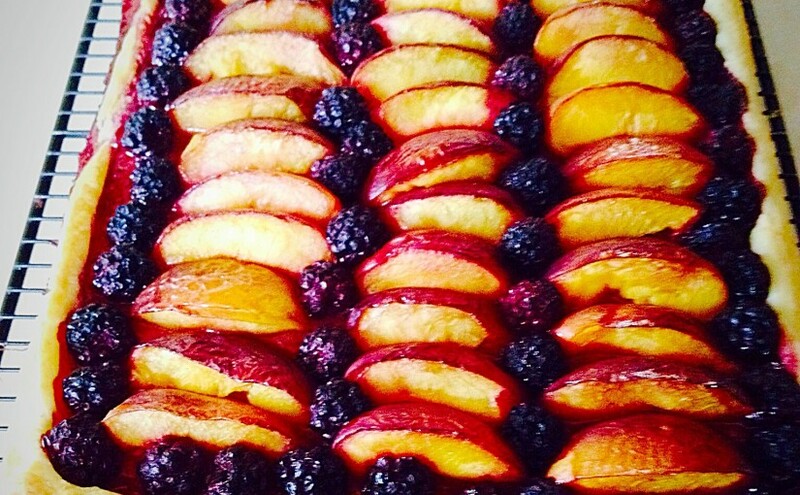 Blackberry Nectarine Tart – utter deliciousness. 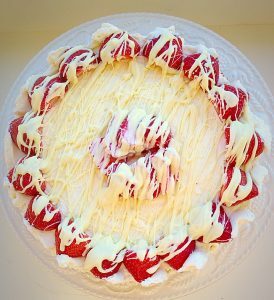 If you keep pastry and fruit in the freezer regularly, I’d say this is the perfect, pull together, easy dessert, fit for snuggling on the sofa watching a film, or entertaining last minute, or even planned dinner guests!! I used nectarines as their skin is so tender it doesn’t need to be removed. 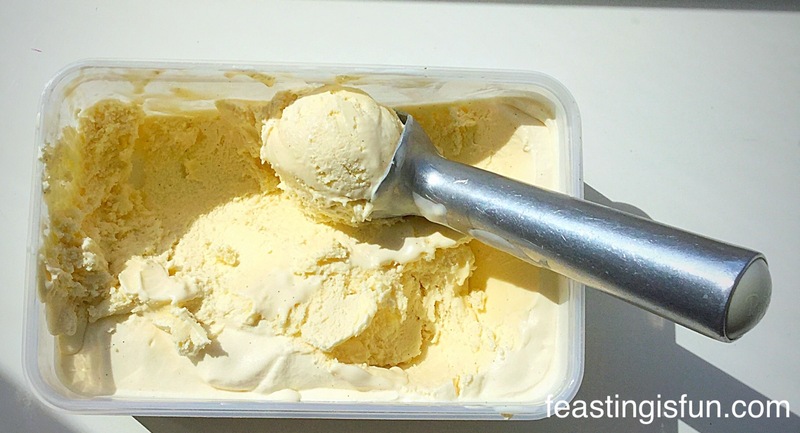 What go-to freezer staples do you keep on hand?